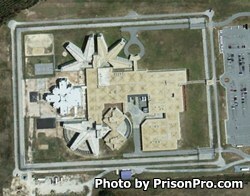 Maury Correctional Institution is located in Hookerton North Carolina, part of Greene County. It is a close custody facility, which is the maximum security level a correctional facility in North Carolina can be. Close custody facilities incarcerate inmates who have committed very serious, usually violent crimes, and inmates who have shown non-compliance to facility rules. Offenders are housed in four distinct units. The Red unit is reserved for inmates who are in the mental health program or in segregation. The Blue unit is for offenders who have medical issues. The Green units is for general population inmates who may participate in programs and work assignments. The Gray Unit houses the most dangerous inmates who present management problems and require a maximum control environment. Offenders at Maury Correctional Institution can receive substance abuse treatment, and receive mental health, medical, and dental services while incarcerated. Additionally, inmates may participate in classes to earn a GED and obtain an adult basic education. All visits at Maury Correctional Institution must be scheduled at least 24 hours in advance by calling (252)-747-1445 and speaking with the visitation officer. General population inmates have visitation on Tuesdays, Wednesdays, Thursdays, Fridays and Saturdays in two sessions; a morning session from 9am-11am and an afternoon session from 2pm-4pm.